A big American shad is the kind of target that plenty of Carolina anglers pursue every February and March. February is a tough month for saltwater anglers. The weather can be brutal, and the sea can be unpredictable. Strangely, the month’s most-predictable saltwater fish makes a big move into freshwater, and plenty of salty anglers follow them. Shad make their annual pilgrimage to reproduce in the same waters in which they were born, and that includes South Carolina and North Carolina rivers that empty into the Atlantic Ocean. 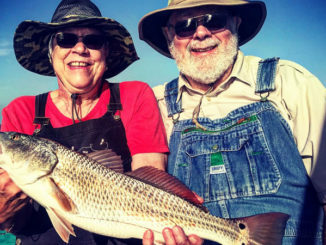 Anglers, many of whom have been chasing large schools of redfish for the past month, turn to these rivers for various reasons. Some like the taste of shad, some like to eat shad roe, some are collecting shad as bait to use for bull redfish and sharks in the coming months. They all agree that these fish are just plain fun to catch. Capt. 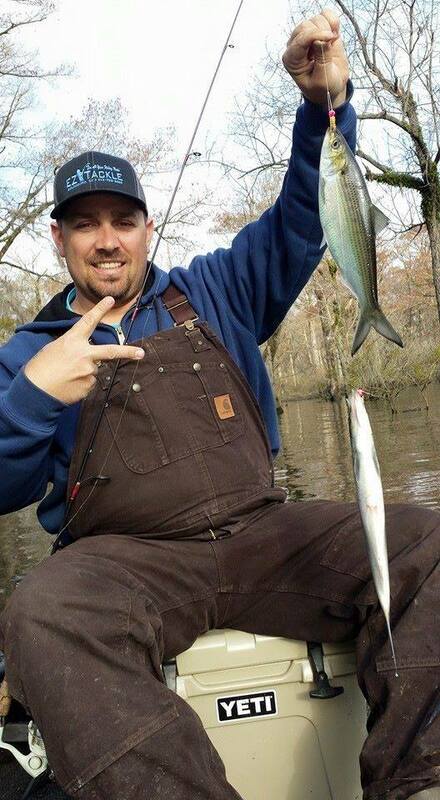 Joel Campbell of Charleston Gigging (843-270-5545) loves this time of year, and shad fishing is a big reason. Campbell said once you set a hook into a shad, you’ll never look down at or underestimate these fish. For many anglers who fish for shad on these rivers this time of year, it’s the only time they aren’t fishing in saltwater. “You’ll see plenty of shallow-water skiffs, bay boats and other craft that are usually only thought of as saltwater boats. I fish for shad out of my 23-foot Avenger, which I generally use for inshore and offshore fishing trips,” he said. Tiny spoons and jig/plastic combos are perfect for use in multiple-lure rigs and can produce plenty of doubles on shad. Double rigs can be built on loop knots, tiny swivels, or by tying a short dropper to the eye or shaft of the first bait’s hook. 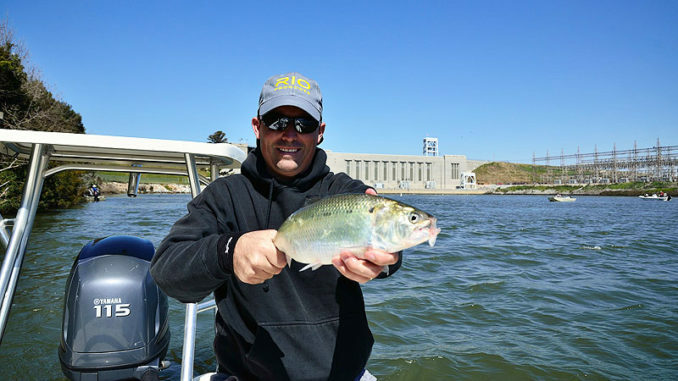 Anglers catch shad on any number of lures, but Campbell is partial to small crappie jigs. He said Sabiki rigs and flies are also popular. He uses 1/16-ounce jigheads unless the current is running too strong, then he sizes up. For the rest of his gear, he uses 7-foot-2 Bull Bay ultralight rods, 1000-series spinning reels spooled with 6-pound braid and 10-pound fluorocarbon leaders. 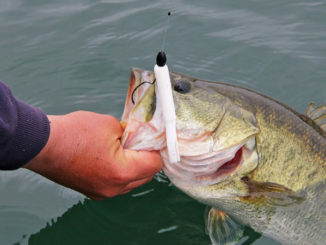 Campbell said most anglers anchor their boats, cast upriver, then retrieve their lures as they drifts with the current. On some days, the shad can be picky and want the lure at a certain speed or depth. Other days, you’ll catch them no matter what you do. Jonathan Grady of the Hobie Fishing Team targets shad from his kayak in North Carolina’s Cape Fear River. He loves fishing an area without anchoring, which his kayak’s peddle-drive system allows him to do. This leaves his hands free for fishing. It also allows him to stay put or make slight moves without ever having to pull up anchor. 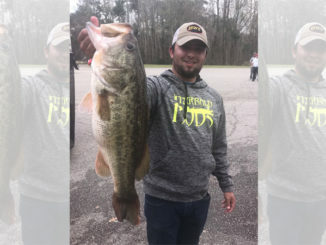 Of the three locks and dams on the river between Wilmington and Fayetteville, Grady said a boat launch is within 100 yards of each one, providing easy access to some of the hottest fishing you’ll find anywhere. Grady uses 1000-series spinning reels that he pairs with a 7-foot, light-action rod. He uses 6-pound line on his reels and a 12-pound leader. 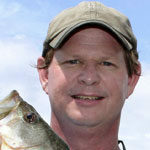 He likes using tandem rigs with 2-inch chartreuse curlytail grubs or shad darts. For pure fish-catching action, Grady said shad fishing on the Cape Fear and similar rivers is the most-productive fishing you’ll find in North Carolina this time of year. For youngsters, fishing newcomers and seasoned anglers alike, he said this fishery is simply an absolute blast. Campbell and Grady both agree that the water flow is very important when shad fishing. Too much current is never good, and a complete lack of current is even worse. Anglers can check the river flow in the areas they’d like to fish by visiting the U.S. Geological Survey’s website and inputting the specific areas of the rivers they’d like to fish at https.waterdata.usgs.gov.